Lovingly restored farm provides great family accommodation. Stunning rural position with walks straight from the door yet all amenities close by. Lidoire has been thoughtfully equipped with all mod cons including super king size bed, new large flat screen TV, English and French Channels, free internet, new kitchen, dishwasher and range cooker . It has its own private patio area with BBQ and stunning views across the valley. Five properties, sleeping from 2 to 12 people. 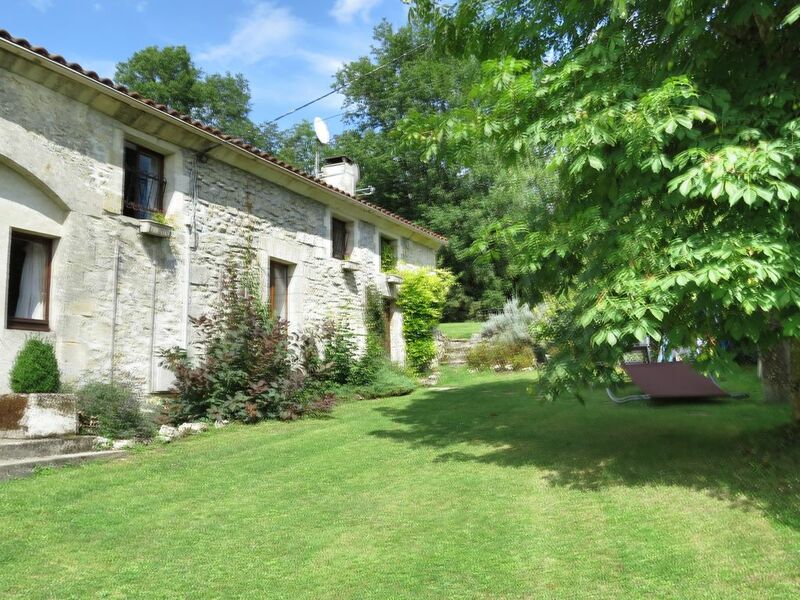 Set in 1o acres of gardens, woods, meadows in the Perigord Vert National Park. The sleepy hamlet of Nadaillac nestles in a river valley between La Rochebeaucourt (5km)and Villebois (8km) close to Angouleme and Perigueux. EVERY WEEK PIZZA EVENING using restored bread oven. Fun for kids and adults alike. Fantastic hospitality, wonderful catering of our special meal, Everything on site superb, see you again next year. Thanks to Nicky and Richard for a most relaxing stay in your enormous gite. Gallivan, Merseyside. Third year, Successful as ever, Tremendous 20, Northeast England. Pizza: On an evening of your choice we can organise a Pizza evening. Make your own pizzas in a traditional bread oven. A great way to entertain the kids and socialize with the other guests over a glass of wine!!! We are a young family and understand well that happy kids makes for a happy holiday. We have provided lots of extra games and toys for kids of all ages. Games room for evening tounaments of ping pong. Dressing up box. Wild flower maze with insect catchers. Try a spot of fishing in our own private lake. Welcoming, safe and child friendly atmostphere means many of our guests return year after year and are now our friends. Just the noise of the birds and surrounded wonderfull unspoilt countryside. Great weather and lots for kids. Bath and shower. Separate toilet. Suitable for elderly and handicapped with no stairs or steps. Charming gite with good facilities. Nicky and Richard were very friendly and welcoming. The gite was charming with its exposed wooden beams. The log fire was amazing and warmed the gite very quickly as we stayed in December. I would recommend this gite especially in the summer with its big swimming and games room for the kids. Nice comfortable little cottage with well equipped kitchen in lovely grounds. Wonderful location & Gallaghers were very helpful & friendly . I would thoroughly recommend it. Rustic Gite with everything that you could possibly need in the kitchen. The pool was lovely & there was lots to do in the games room for our children(12&9). Lovely walks from the Gite & our dog was made to feel very welcome. Richard & Nicki were both helpful and friendly.Nicki was very helpful in organising a vet appointment for our dog before we came home. I could not recommend this lovely group of gites more-in fact our children are already pressurising us to rebook next year. Very relaxing stay at this property with our baby. The gites has everything you could possibly need and the pool and garden area were lovely. We just returned from our holiday, & I asked the family to vote, everyone said '5 stars'!!! We have had the best time at Les Rivieres, we stayed in La Lidoire and found it had everything we needed, and was very comfortable and completely as described. Our children are 5 1/2 and 2 years and 10months, and it suited them well as the accommodation didn't have stairs and was on one level. Plenty of facilities to cook and to BBQ, and it was all clean and well looked after. Nicky and Richard were welcoming and made our holiday very enjoyable, and the kids loved messing around in the pool with their two children too, and they were very sweet and shared their own toys with Jacob, our youngest. Pizza night was fantastic, and everyone staying there got together. We visited the local caves, took the kids to the local parks and the surrounding villages were lovely. With young children the main aim was to relax, which we did, in the evenings it was very peaceful, and lots of fun in the day. We would definitely return in the future, and explore the area more as the children get older, such as the beach lakes. Definitely recommend! We had a perfect 2 week stay. The children loved playing in the games room and swimming in the pool. The weather was Devine so plenty of barbecues. The area is filled with things to do. Canoeing in Brantone, high rope swings, outdoor swimming pool with slides and many river beaches. Richard and Nicky are fantastic hosts and nothing is too much trouble from advice on places to go and resteraunts to try and arranging bikes in any size required. The gite was spacious and clean. It had everything you would need for a relaxing stay including sky tv. We even had a go at fishing in the lake but unfortunately none of us caught a fish on that occasion. We did get to see some deer who came for a drink in the lake which made up for no catch. The holiday was truly fantastic!!! Situated on the Charante/Dordogne border between Brantome (25mins) and Riberac (25mins). The property nestles in the Lizonne River valley of Perigord Vert Naturel Park and is surrounded by woods, meadows and sunflower fields. The local town of Villebois Lavalette (8km) has all amenities including an excellent super market and restaurant. Angouleme (25mins) and Perigueux (40mins) are easily accessible excellent for shopping, hypermarkets, cathedrals and museums. Many local chateaux to explore, wine and cognac tasting, troglodyte caves, Lascaux, St Emillion, local fairs and car boots, excellent restaurants and lovely country lanes to explore on foot or by bike ( free bikes available). Lots to do for children, futurscope theme park, beachs at Auberterre and St Estephe, canoeing, Zoo at La Palmeyre, Valley of the Monkeys, aquarium, horse riding for all levels, Go-karting and quadbiking all close by.